Jon Gray. Credit: Benny Sieu, USA TODAY Sports. Ryan McMahon’s turbulent season reached its unexpected high Friday night as he paused rounding first base, looked back at his dugout and clapped twice with a wide grin on his face before continuing around the bases. Nearly two weeks after beginning his third stint in the majors this season, McMahon launched a game-winning, two-run home run to down the Los Angeles Dodgers, 5-4. The young infielder replaced Nolan Arenado in the fifth inning, who left the game with right shoulder discomfort. Down 4-3 in the seventh inning, McMahon sent a 1-0 fastball over the center field wall to give the Rockies a lead they would not surrender. McMahon’s excitement spilled out as he enthusiastically rounded the bases for the third time this year. Both offenses got off to quick starts as the Dodgers opened the scoring in the bottom of the first inning. Justin Turner doubled down the right field line and came around to score on a Yasmani Grandal single up the middle. The Rockies responded in the bottom of the frame when DJ LeMahieu blasted a two-run home run to give the Rockies a 2-1 lead. After Charlie Blackmon led off with a single, LeMahieu let loose on a 3-2 fastball over the heart of the plate, sending it into the bullpen in right-center field. Colorado added another run in the third inning thanks to Trevor Story’s hot bat. With Carlos Gonzalez on first base after drawing a walk, Story waited on a breaking ball and lined it into the left field corner. Gonzalez scored from first to open a two-run lead after three frames. 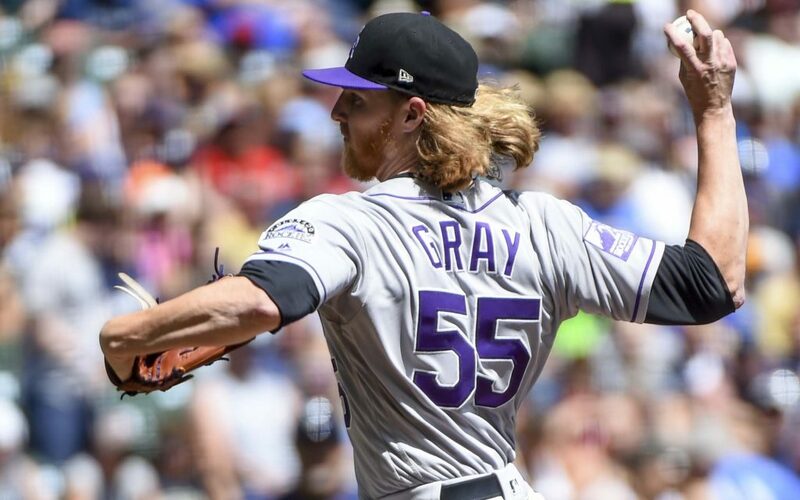 What looked like yet another immaculate start for Jon Gray after being recalled from Triple-A Albuquerque in mid-July took a detour in the fourth inning. Dodgers’ rookie Max Muncy hit his 26th home run of the season – a moonshot to right-center field – to even the score at 3-3. In the next inning, Gray lost a pitch inside that hit Turner on the elbow. Three batters later, Cody Bellinger recorded his third hit of the night to score Turner from second and give the Dodgers a 4-3 lead. Gray fought through some traffic to pitch 5.2 innings, allowing four earned runs and eight hits while striking out four on a season-high 109 pitches. Manager Bud Black said Arenado’s injury occurred on a double play the Rockies turned in the third inning. Though it did not appear serious, the discomfort was enough to force him out of the contest. McMahon replaced the All-Star third baseman and unexpectedly became the hero in the Mile High City. After Gray’s departure, the bullpen shut down the Dodgers for the remaining 3.1 innings. Harrison Musgrave stranded an inherited runner from Gray before being replaced by Jake McGee the next inning. Despite holding an ERA north of 10 after the All-Star break, McGee pitched 1.2 scoreless innings. Scott Oberg notched the last out of the eighth inning before handing things over to Adam Ottavino to notch his fifth save of the season. The Rockies grinded out the victory despite going 0-for-13 with runners in scoring position. The win cut Colorado’s deficit in the NL West to 2.5 games behind the Dodgers. Colorado is now 5-0 in Jon Gray-started games since being recalled. Game three of the four-game series will begin Saturday at 6:10 p.m. at Coors Field.